ANSI Process Pumps are excellent for efficiently pumping water and oil. Even well selected pumps wear over time, and when the time comes, Powerflo is your top shelf choice for gear pump repairs in California. Powerflo Products Inc. provides pump rebuild services to factory new specs and clearances This Goulds 3175M 8x10x22 received a new shaft/bearing kit, 316SS dynamically balanced impeller, sleeve and gasket kit. The pump was also upgraded from it’s basic component seal to a cartridge seal for easier back pull out maintenance and setting the impeller clearance in the field. 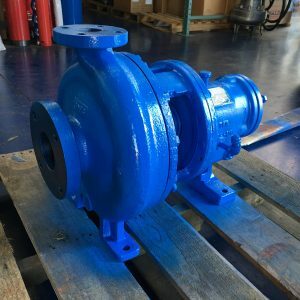 The blue pump is a Goulds 3175S 6×8-14 which received a complete cleaning, new bearings, labyrinth seals, gaskets, shaft sleeve, and packing. 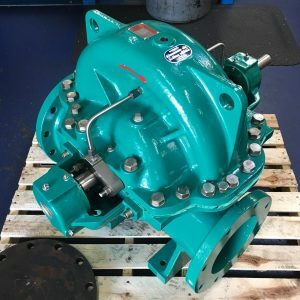 Powerflo rebuilds and also can provide parts for all brands of centrifugal pumps such as Goulds, Aurora, Fairbanks Morse, Myers, Hydro-Matic, Flowserve, Worthington, Gorman Rupp, Summit, Griswold, Peerless, Carver, Deming, Crane, MTH, Burks, Barnes … and the list goes on! Facilities in Southern California such as water departments, pulp and paper mills, oil refineries, oil production fields, waste water treatment, food, beverage and general industrial manufacturing plants partner with Powerflo Products Inc. for fast, efficient, and reliable repairs to their rotating and processing equipment. 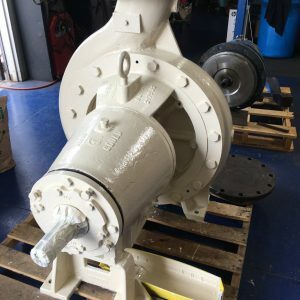 Powerflo Products Inc. provides pump rebuild services, such as this Worthington Flowserve double suction split case pump, to factory new specs and clearances. This pump rebuild is an example of Powerflo’s experienced capabilities. For corrosion resistance the pump has been coated throughout with Skotch Kote 134 and utilizes our custom machined 316SS seal glands. The impeller was trimmed and dynamically balanced. This pump, like every Powerflo pump rebuild, was hydro-static tested for leaks ensuring a leak free install and start up. All major brands served such as Goulds, Aurora, Peerless, Worthington, Fairbanks Morse and Bell & Gossett.